We all know that drinking green tea is good for health, but how many people really understand its benefits? here are the benefits of drinking green tea. For many people nowadays, drinking tea seems to have become a habit. 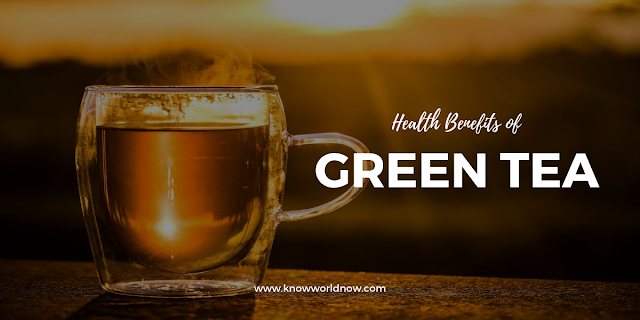 No matter what kind of tea is good for health, of course, tea is also a well-known health drink, and among them, green tea is the most familiar to everyone. 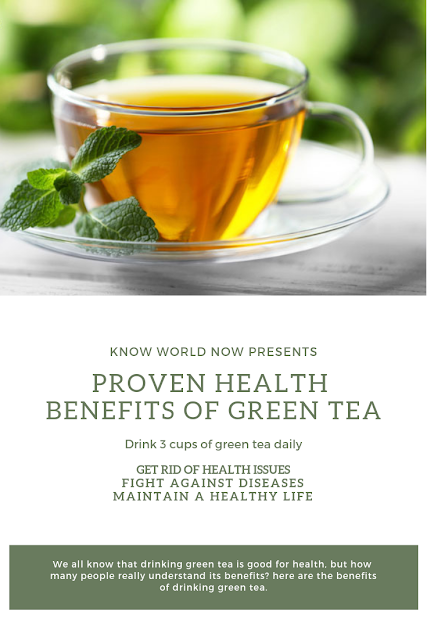 A healthy diet, in the past 20 years, thousands of studies have said that drinking green tea is good for the body, what are the specifics? Green tea is produced from unfermented leaves of Camellia Sinensis, which is originated in china. It contains various proteins, full of antioxidants and many other ingredients which is very beneficial for a healthy life. Green tea contains L-theanine, which can reach brain through the blood brain barrier. L-theanine causes brain to secrete GABA, which is an inhibitory hormone, that calm your brain by reducing stress. Green tea contains certain amount of caffeine. Caffeine helps to block the action of adenosine, an inhibitory hormone. Thus, it increases the concentration of nor-epinephrine in our brain, which reduce our fatigue and make us energetic. Green tea boosts our brain. Reducing stress, it helps us to concentrate and make our memorizing power stronger. Green tea induces dopamine release in our brain, which is a mood regulator. Nor-epinephrine and dopamine synergistically work to turn on our mood which helps to make our day happier. Green tea is full of epigallocatechin Gallate, which is an anti-oxidant. It reduces our cell injury and makes our tissue healthy, which is essential for your younger look. According to research daily intake of Green tea help to reduce your cholesterol level. LDL is the main concern; high level LDL gives rise to various health problems, so it termed as BAD cholesterol. LDL level can keep in limit by Green tea. Green tea helps to reduce the risk of stroke and heart attack. By lowering the cholesterol level and preventing the oxidation of LDL (bad cholesterol), which is the main steps of forming atherosclerosis (fat deposition in the arterial wall), prevents the occurrence of cardio-vascular events like stroke and heart failure. It contains catechins which helps to fight with influenza virus (which causes respiratory illness) and certain types of bacteria like streptococcus. It contains polyphenols which has anti-inflammatory action combined with the anti-oxidant action of catechins, which makes our skin grow healthier and help to reduce the appearance of age related wrinkles. Local application of Green tea helps to clear up acne. Green tea catechins fights with local bacteria of mouth and make our mouth fresh. By inhibiting the action of cavity forming bacteria on teeth, it helps to protect our teeth from cavitation. According to research Green tea reduce the risk of cancer in certain amount. Study shows that person taking Green tea daily, in less chance of breast cancer (20-30%), colorectal cancer (40%) and prostate cancer. It also fights against esophageal, stomach, skin cancer (melanoma). It prevents oxidative damage of brain by free radical. Study shows that; People taking Green tea are in less risk of developing dementia (Alzheimer’s disease) and parkinsonism in old age. Atherosclerosis and anxiety are important causes developing high blood pressure. Green tea prevents both, thus protects us from the adverse effects oh hypertension. Green tea increases insulin sensivity and regulate the glucose level. By its anti-oxidant action it also reduces the risk of developing cardiovascular and neurological side effects of diabetes. It protects our eye from the oxidative damage of our vision free radicals and improves our vision. According to study it increases the mineralization of bone and thus make our bone strong. For burning fat, Green tea is a good solution. It reduces our appetite and increase fat oxidation. Thus, it helps to loosen weight quickly. When to Take Green Tea? Morning Green tea in empty stomach is not recommended, which increases chance of peptic ulcer. It should not be taken immediately after meal, which may hamper iron absorption. Green tea before going to bed may hamper your sleep. Best time of taking Green tea is between the meals. How Much Green Tea is Good for Health? Excessive of anything is always bad. Daily 3 cups of Green tea is recommended for best benefit. I love green tea! It’s so comforting especially when you’re sick!